With all the options and information available online nowadays, few people purchase a product or service immediately after finding it. Instead, they will go through several Buying Stages: Information Search, Evaluation of Alternatives, and Ready to Buy. Each of these buying stages results in a different ‘Moment of Search,’ which is the moment when someone Googles their problem. Obviously, showing up in these searches gives you a better chance of turning a visitor into a customer, but targeting them at the right buying stage increases your chances of getting the sale that much more. Google searches are driven by keywords, but what keywords are used will change depending on where the buyer is in the buying cycle. A buyer just starting out, who has little knowledge of the product or service they need, will use general keywords to describe their problem. A more educated buyer will use more specific keywords that match their needs or desired features. Beginning: Information Search — How big is this problem? Do I really need to buy something? Middle: Evaluation of Alternatives — Yes, I need to buy something, but what? What’s the right service/product for my needs? End: Ready to buy — A purchase will be made, but need to determine the best deal for my needs. A keyword strategy focused on at least one of these buyer stages is vital to being found on Google during the ‘Moment of Search.’ After all, your keyword strategy determines who and when will see your website in the Google listings. What’s the best stage for your business to attract buyers? Attract them too early, at the start of their buying process, and they may forget about you by the time they’re ready to make a purchase. Attract them too late, when they are anxious to make their purchase, and they may not engage with your website. It’s important to build your keyword and Google AdWords campaigns around buying stages so you attract buyers at the right time for both of you. 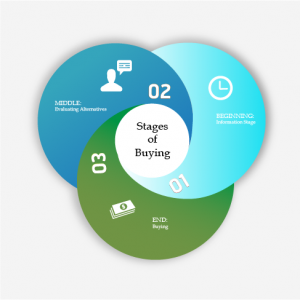 Information-seeking buyers are usually at the beginning of their buying process. They are trying to learn more about their specific problem, what products or services are available, and determine whether or not they need to make a purchase. Their Google searches will use more general keywords. In this first Buying Stage, keywords focus on the problem’s symptoms, rather than the products or services specifically. For example, the buyer may Google “how to fix a leaky pipe” instead of looking for a plumber, or “what kind of flooring is best for basements” instead of looking for ceramic tile or vinyl flooring. It would be a shame to have invested in buyer education, only for someone else to scoop up the sale because you didn’t have the content or commitment to follow the buyer to the end of the buying cycle. If your business has the content marketing volume and systems in place to distribute that content throughout the buying cycle, you will benefit from keywords that focus on educating buyers. Otherwise, it may be wise to use a keyword strategy that attracts buyers further down the sales funnel. Buyers who are evaluating alternatives have made a decision to purchase a service/product to fix their problem. They are examining what is available from you and your competitors. They are doing a feature benefit comparison. These buyers will use more specific keywords in their Google searches than buyers seeking information. At this stage in the Buying Cycle, buyers are using keywords that are more descriptive of the product/service they need, and what specific benefits or features they would like. It’s great when your website shows up in these searches because the buyer is more likely to make a purchase than an ‘information seeking’ buyer because they’ve already done their research. On the other hand, since these buyers have done their research by visiting many other websites, they probably have higher expectations, including that your website match or better the experience of competitive websites. If they like what they see on your site, you can expect a store visit, phone call or email. Feature/benefit keywords will be attractive to these buyers, so focusing on those will help pull your website up the search rankings. This buyer is in the final Buying Stage and is ready to make a purchase. If they’ve been contemplating this purchase for a while, or it’s been difficult to filter through information and come to a decision, they will likely be impatient to close the deal. At this stage, the buyer’s Google searches will reflect a high level of knowledge and a desire to find the best possible supplier. These buyers are looking for the best deal — price, features, delivery and service reputation. For your website to show up at this very late buying stage, your keyword strategy needs to emphasise the reasons to buy from you and not from someone else. Focus what makes you better and different: Discounts, sales, free delivery, service, etc. Those are the things these buyers are looking for. Google AdWords is one of the best vehicles to advertise and promote your business’s features and benefits at the top of the search page. Your ad and website need to be compelling enough to get you a chance to interact with this impatient buyer.